Changing dogs from sport to police leads to serious problems. I call such training from spot to police or use sport training methods to train police dogs "SPORTISM" . Even though this type of training is a major such approach for LE training these days it is flawed and it leaves a the final product -LE dog or pp dog with baggage which will burden many LE/PP dogs for rest of their life. IMO and experience it is better to train a dog from get-go as a PP or LE dog and not first as a sport dog and changing such dog to LE/PP dog. I disagree with this statement, and wanted to start a new thread to discusss this. I have trained a couple of dogs with a sport foundation and then they were sold to police departments and became validated K9's. One was a GSD and the other a Mal. IMO, the abilities and character of the dog will dictate whether or not that dog could be started in sport then become a successful K9, rather than any particular (non-counterproductive) 'foundation'. This thread was not started to 'attack' the person who made the above quoted statement, but to initiate discussion and healthy debate, so please keep it respectful, thanks. Koots, can you tell me - how the dogs, you trained before they were sold to LE, had been taught to act in violent confrontation with human? 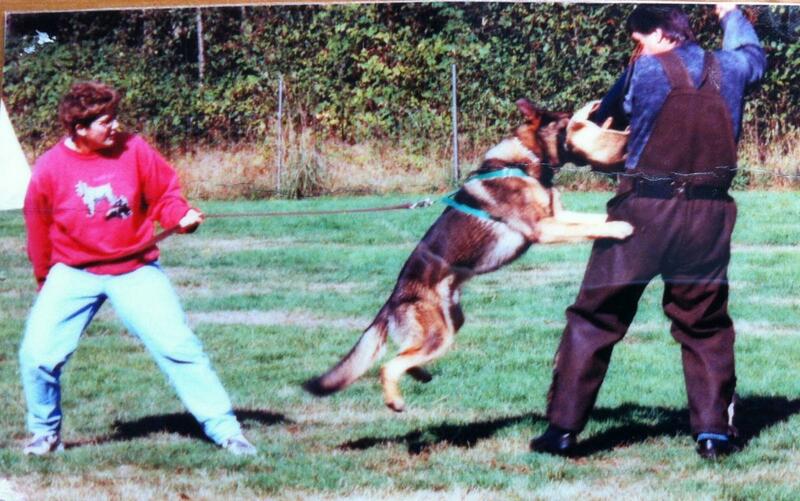 Valk - I cannot attest to the GSD's training in the LE dog program, but he did become a validated K9 in BC. My training with him was in a schutzhund program, with foundation work on grip, targeting, etc. I sold him as an 18-month old 'green' dog, with started sleeve work, and the rest of his training in man-work was with the PD. That dog was 2-3 on Harro Lechrainstadt, BTW. The Mal was trained in schutzhund, a bit of Ring sport, and also went with me when I did decoy work (volunteer) with my local police unit when they had new dogs. She would run through many of the profiles that the GSD's did, including building searches and man-work. She was the only dog in the group that correctly targeted the 'bad guy' when doing the muzzle attack in the 'handler on ground with bad guy on top scenario' - keeping in mind that all the other dogs were fairly new to their handlers at that time. This female Mal was purchased (at 3 yrs old) by an Arizona PD and became a dual-purpose scent/patrol dog. Koots, my first police dog started out on the sport fields. I raised him from a seven weeks. Grew to be a hard dog, strong in the head, good nerves and a love for any work. In the sport he was a very good, energetic and focused in heeling. Not the fastest retrieves, Tracked a little fast. We failed our schutzhund 1 track. No sooner than starting back up after the first article, he stopped and decided to hike his leg on a tall clump of grass. Never did that until the trial. Never did it again. Changed gears as needed. Loved the fight. A little difficult to clean up on the hold and bark. Not the cleanest out. Had to use a plastic guard to cover the cuff to keep him off the elbow. Even then, on an escape bite it was almost certain he would go back. No problems carrying the sleeve. In fact, the sleeve or suit was slipped through out his police dog career too. Did not do a formal out exercise while working the streets. Used a call-back to get him to let go of the suspect. As a police dog, he was very successful in locating the criminal on the track or area searchs. Only located two suspects in buildings his entire career. Quite a few in houses during warrant service. Good, hard, deep grips on the suspect. Liked to drive forward on the bite. Screaming, yelling, hitting or trying to pry him loose caused an immediate counter. Spend most of his life on the bite bar and arm of the suit, but I cant recall him ever biting the arm on the street. Real bites were to the shoulders, one time to the chest and one time to the waist (his first street bite), others to the legs, mostly right below the knee (like every dog I worked with, he seemed to prefer the legs on a suspect who was running). That was the only dog I had trained in the sport and then went to LE. I policed with other dogs, some of which were trained in other venues. One was a KNPV 1, another was Sch II. Two had their SVV1. I can tell you how these performed on the street, but have no idea how they performed in the sport. Once I selected them we started a different style of bitework. I also ran as backup officer with several other dogs I had trained for LE and have first hand knowledge how they worked on the street. Some of those also had their IPO or ZVV before starting their careers as police dogs. All the dogs I worked with or ran as a back up officer were German Shepherds. I have to disagree with this statement also. I have worked primarily with trainers that were quite successful in both sport and police dog training. It's really hard to believe that the dogs they train to be police dogs will be a burden to their departments if they had prior sport training. We can all agree (hopefully) that the ideal GSD should be capable of doing just about any job. Why then is it not capable of starting off in sport then switching over to police work? Also I hope this can remain a respectful and informative discussion, there are a lot of people on here that have tons of experience and I personally enjoy listening to their views, even if I don't particularly agree with them. I disagree, too. It's genetics first and foremost. Used to test and buy "weeded out" IPO dogs for a broker quite some while. I quit because I didn't like the heartbreak within the families. Helped training imported IPO dogs in California for police for half a year.. I have titled dogs in Sch/IPO in two different eras. I have handled/trained LE/military dogs. I do not agree with the statement in regard to training, because the validation of LE dog is based on results, not personal preference in training mode. A naturally civil dog will revert back to his default( which “IF” is naturally civil, as opposed to which way he was trained first), when placed under stress will resort to genetics. A prey monster with good fight, will revert to prey energy when the Adrenalin kicks in and the fight makes him successful in LE such as Mals and some German Shepherds. Training shapes what the dog is, but it can’t override what the dog is. So I agree with Susie and others that genetics is first and foremost. I cannot attest to the GSD's training in the LE dog program, but he did become a validated K9 in BC. My training with him was in a schutzhund program, with foundation work on grip, targeting, etc. i can't as well. but from what i have seen, cornerstone of LE training very much resemble sport. here is example of LE training. apprehension no differ from SchH, dog don't face resistance, in fact limited to play tug-of-war for prize. and here is outcome of this type of training, when dog plainly becomes single use kamikaze.